The BOOK Of The THOUSAND NIGHTS And A NIGHT. A Plain and Literal Translation of the Arabian Nights Entertainments Made and Annotated by Richard F. Author: Burton, Richard [1821 - 1890] - Translator. Van Vliet, Emile - Editor. Title: The BOOK Of The THOUSAND NIGHTS And A NIGHT. 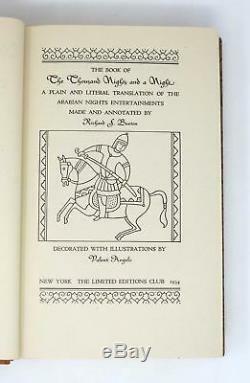 Publication: New York: The Limited Editions Club, 1934. 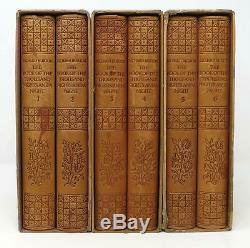 Edition: 1st edition thus (Newman & Wiche 59). Description: New York: The Limited Editions Club, 1934. 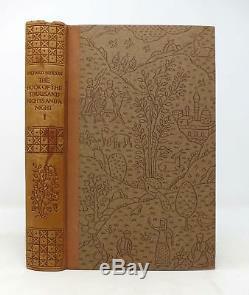 1st edition thus (Newman & Wiche 59). Natural tan cowhide blindstamped spines over light brown patterned-paper boards, designed by Macy. A VG set with a bookplate in each volume, housed in VG slipcases which have wear to the seams [most notably the first, above the title label]. Item #31019.1 An unabridged translation, with notes & terminal essay by Burton. Established in 1989, Tavistock Books has been in its present Alameda location since 1997. We are a general antiquarian business, with material ranging from Aviation to Zoology, from the 16th C to the 21st. We have specialties in Dickens, History of Nursing, Children's Serial Fiction & Western Americana. If the return is due to an error on our part, we will reimburse you the cost of your return. We are members of the Antiquarian Booksellers' Association of America (ABAA), and the International Online Booksellers Association (IOBA). We leave feedback for buyers once they have posted feedback for us. We work hard to keep buyers happy and to promptly resolve the rare problem that may arise. This listing was created by Bibliopolis. The item "Richard Burton / LIMITED EDITIONS CLUB The BOOK Of The THOUSAND Signed 1st 1934" is in sale since Thursday, April 4, 2019. This item is in the category "Books\Antiquarian & Collectible". The seller is "tavbooks" and is located in Alameda, California. This item can be shipped to North, South, or Latin America, all countries in Europe, China, Japan, Australia.